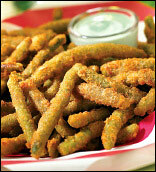 Head over to TGI Friday's Facebook page and 'like' them to print a coupon for Free green bean fries! The coupon is good for Today Only! So hurry and print yours to have an awesome lunch of dinner.